It took a month, but I've finally finished my comments on the Revised Draft SGEIS on the Oil, Gas and Solution Mining Regulatory Program (September 2011) - Well Permit Issuance for Horizontal Drilling and High-Volume Hydraulic Fracturing in the Marcellus Shale and Other Low-Permeability Gas Reservoirs. My comments challenge Chapter 4, Geology (4.2MB PDF). I've posted it as a PDF with footnotes (94KB) or below as Web-friendlier but less formal HTML. The most painful part of this process has been doing research that really shouldn't have been difficult for the DEC to do itself. The more closely I look at what they chose to research and report on in this key section, the more I doubt their overall regulatory approach. I focused my review of the Revised Draft SGEIS on the Oil, Gas and Solution Mining Regulatory Program (September 2011) on Chapter 4, Geology. This key chapter has major flaws which undermine the credibility of the rest of the document and any resulting regulations. The fundamental problem is that this chapter avoids explicit discussion of fractures in the strata, especially deep strata. It uses old data to avoid obvious places where this discussion might be important, and attempts to argue away the possible consequences of these issues. The 1992 GEIS acknowledges deformations, fractures, and porosity in its Chapter 5, Geology. In particular, it notes that "the faults, folds and associated fracture systems formed during the Appalachian Orogeny have been of primary importance in trapping oil and gas in the overlying Devonian strata." ["Generic Environmental Impact Statement on the Oil, Gas and Solution Mining Regulatory Program (GEIS)", page 5-25.] These acknowledgments, however, are included primarily in the context of where to find oil and gas, not in regard to their effects on the environment or the health and safety of human, animal, and plant populations. The Revised Draft SGEIS misses several opportunities to consider these issues. Section 4.5, Seismicity in NYS, uses a 1977 New York State Museum map, Preliminary Brittle Structure Map of New York , for Figure 4.13, Mapped Geologic Faults in New York State. More recent research by University of Buffalo Professor of Geology Robert D. Jacobi shows that that map is extremely incomplete. Finding that research is not difficult. [See, for example, "Faults crisscross upstate NY".] His maps [http://www.sciencedirect.com/science/article/pii/S0040195102002780] show far more faults and possible faults than the SGEIS, with faults crisscrossing western and central New York State in his Figure 5. Faults are important not only for their seismic potential, but because they are places where layers share common breaks, places where liquids and especially gases can move far more easily than they can even through porous rock. The Revised Draft SGEIS does not mention these issues at all. These common geological features raise basic questions about the basic approach of the SGEIS, which appears to assume that all movement of material underground is contained to the area where active drilling, fracturing, and extraction is taking place. This leads to important discussion of well casings and setbacks, but also avoids mentioning possible problems further from the wellhead itself. Section 4.7 of the Revised Draft SGEIS, "Naturally-Occurring Methane in New York State" brings these problems to a head. It points fingers for well-water contamination anywhere except drilling, and argues that the case is closed without providing any concrete data beyond the prior existence of methane in many geologic structures. Yes, methane occurs naturally in many of the strata below this part of New York State. Yes, that methane sometimes causes problems for well water, and might do so whether or not any additional gas wells are drilled in New York State. However, this section makes no effort whatsoever to determine whether gas drilling (of any variety) could be a contributing factor to such disruptions beyond the creation of the well hole itself. The statement "The migration of methane can contaminate well water supplies if well construction practices designed to prevent gas migration are not adhered to" (4-38) is true but incomplete. The section's handling of "the Duke study" [Methane contamination of drinking water accompanying gas-well drilling and hydraulic fracturing] is probably its worst moment. It cites the study, then says absolutely nothing about the paper's conclusions except to note one series of data from wells in New York State. Amid complaints that the study itself used too small a sample size, the dSGEIS's approach of reducing the sample size further to draw convenient conclusions is a very strange and irresponsible response. The study's actual conclusions deserve further exploration and may well change the regulatory framework described in this document. They found substantial increases in the methane content of shallow well water within one kilometer of active shale-drilling options, and while the concentrations were highest closest to the wells, they continued to be very high within roughly that one kilometer circle. "increasing the connectivity of the fracture system" and the enlargement of "the extensive fracture systems reported for these formations"
Point 3 is the most difficult point, the one that this section carefully avoids. It is the hardest to regulate, requiring substantially more research than is provided in this document to determine the extent of fractures. They point out that while it is difficult for liquids to migrate quickly, the "relatively common phenomenon of rapid vertical transport of gases (Rn, CH4, and CO2) from depth to the surface" remains a threat. Unfortunately, ignoring these possibilities limits the effectiveness of all of the remaining proposed regulation. I would ask the DEC to reconsider issuing regulations for hydrofracking operations until you have taken the time to study these questions and determined how best to handle problems that are difficult to regulate, rather than ignoring them in favor of addressing the ones that seem easiest to control. Update: It could be worse. I could have called Senator Schumer. Even the added explanation in the update at the bottom there doesn't make this any better. A few weeks ago I called Congressman Richard Hanna's office to register my objections to HR 3261, the "Stop Online Piracy Act". I regard SOPA as perhaps the best example ever of a proposal for protecting vested interests by giving the fox control of the henhouse. Copyright holders will be able to pretty much shut down entire sites when they claim there have been copyright violations. David Carr has written a somewhat kinder interpretation of the law for a broader audience. My job is all about creating copyrighted information, and you might think I'd be interested in protecting it, but this is a case where the cure is a few thousand times worse than the illness. It's hard to imagine a better set of tools for squashing non-commercial speech that happens to reference commercial speech, while blundering around the Internet tearing down sites pretty much at will. Like you, I believe strongly in the importance of free speech, as it is a cornerstone of American democracy. In addition, an individual's hard work, ingenuity, and creative deserve the strongest protections possible. For these reasons, I am committed to protecting an individual's freedom of speech, as well as their right to fully reap the benefits of their own hard work. In other words, Hanna looks forward to selling out a lot of what should be protected speech in favor of protecting commercial speech. I'm sure his office will be very helpful when constituents suddenly find themselves trolled for copyright violation fees by companies who've decided it's more profitable to litigate than create, wielding the blunt clubs that SOPA offers them. Here's hoping he's not my Congressman much longer. For years, I've wanted to get a better sense of what's happening on the highway in front of my house. Maybe owning one lane is part of why, maybe the noise from the road that makes outdoor activities difficult is part of it, and maybe some of it is my growing interest in gardening the hillside by the road, where I get a massive dose of what it's like to be on the road. At first I was mostly interested in the speed of the cars going by. The speed limit is 45 mph, but even at a rough guess, I suspect that 2/3 or more of traffic is doing at least 50. Then I watched the state count traffic, and map it, and realized how little the single number "7383" tells me about traffic on this road. Over the summer I started measuring sound levels, and routinely got readings around 87-89 dB at 35 feet from the road centerline. 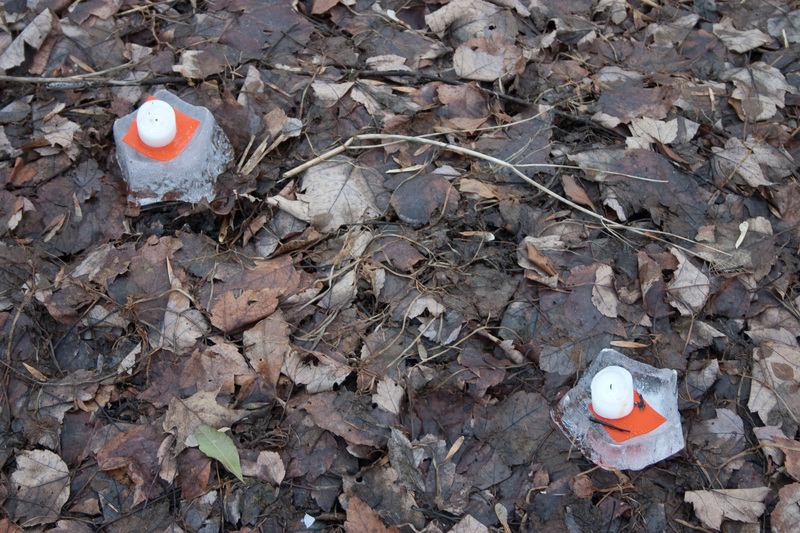 I've also been working on collecting weather data, though my station is further back from the road. As I've pondered ways to make that more useful, pointing a camera at the road made a lot of sense. That's the main piece of weather information many people want, especially given that plows can't be everywhere at once. I've been interested in air quality for a while, but found after a while that there isn't a lot of general air quality measurement here. Because we don't have that much traffic or industry, the usual assumption is that we're fine. I have my doubts, especially near the road, but need to test them before I can say much more. Finally, and maybe too obscure, the increasing number of local earthquakes and seismic impacts around hydrofracking and injection wells (a 4.0 earthquake in Youngtown, Ohio? What?) has me wondering about seismographic monitoring. Given all of that, I probably have five years of work to do on this, and a lot of challenges in figuring out ways to do this reasonably cheaply. It's getting easier, as the DIY movement takes off and tools like Arduino make connecting sensors to computers and networks much easier, but I'll talk about that in later posts. Why not let the government do this? Why should you spend the money and time? While I'm glad that our local, state, and federal governments do the monitoring that they do, they have their own set of limitations and their own set of restraints. It's obviously expensive to set up monitors up and down the highways, to put air quality monitors in places where problems seem unlikely, and a pain in the neck to lay down traffic counters and take them up again. All of this work has to be done outside, requires calibration to meet various standards, and generally built to withstand difficult scrutiny of courts and politicians. There's an industry segment that caters to those needs, but given those demands and a small market, their products tend to be very expensive. Taking a DIY approach loses some of those constraints. Of course, it's still hard to make things work reliably outdoors for long periods of time. I spent part of my morning working on what's probably too simple an enclosure for some key pieces. While I do plan to calibrate my sensors, I also don't expect the results to be used by themselves for decision-making with expensive consequences. This approach also frees me to just plain share the data, both in real time and as it accumlates. All of it, without concern that some interest will be offended, some project derailed, some fears raised that might be inconvenient for government or commercial projects. Ideally, no one will have to ask me to share the information, because it (and the specifications for creating it to the extent possible) will all always be available for free. Forget FOIL or FOIA requests. Finally, this approach lets me monitor the place that matters most to me: right here. Governments have to cover a lot of places with limited resources. It's hard to leave data collection equipment in the field for a long time, because that equipment is also needed elsewhere. 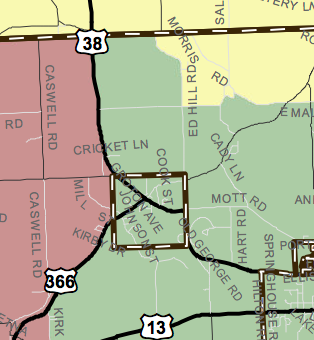 Route 366 traffic patterns, however, change a lot depending on when you're watching. Next up, I'll talk more about what to monitor, and possible ways of getting there. Last night's race for Chair of the County Legislature ended without a chair, as legislators deadlocked 7-7 between current Chair Martha Robertson and contender Mike Lane, both legislators from Dryden. Despite nine ballots, members of the Tompkins County Legislature have failed to yet elect a Chair of the Legislature for the 2012 term. The position of Chair is filled each year by a majority vote of the 15 members of the Legislature. Nominated were incumbent Martha Robertson (D - District 13/ Western Dryden) to continue for a third year as Chair, and Michael Lane (D - District 14/Eastern Dryden), who has nine years of experience as Legislature Vice Chair. The chair is responsible for overseeing all Legislative functions. After failing to reach a decision on the first two ballots, Legislators tabled the item to complete other business, then resumed consideration at the end of the meeting, where seven additional votes produced the same result. After three unsuccessful attempts, the Legislature on the fourth time voted to adjourn the meeting, and delay the leadership decision, until the Legislature's next regular meeting January 17th. Until a new Chair is elected, Legislator Frank Proto (R - District 7), who was elected Temporary Chair to preside over the chairmanship vote, will continue to serve in that interim position. The Legislature has not yet addressed the election of the Legislature's Vice Chair. In nominating Robertson for another term, Legislator Pryor said that while she has a great deal of respect for all her colleagues, and particularly Legislator Lane, she believes that, continuity in the leadership position is important, considering the challenges the County will face this year. And she praised Robertson as for her time commitment, tireless effort, and hard work in the Chair's position. Nominating Lane, Legislator Mackesey praised his extensive past experience in nearly 15 years as a legislator, chairing almost every committee and as Legislature vice chair. She said Lane brings the perspective of rural residents, appreciates the role of county government, and understands that the Chair is a first among equals. The election of the Chair and Vice Chair will be the first items considered when the Legislature reconvenes in two weeks. In past experience, the missing legislator, Carol Chock has seemed a likely ally of Martha Robertson, but you never know. This also makes me wonder if these kinds of deadlocks will be more frequent with the 14-seat legislature the Redistricting Commission seems to be proposing. Update: Here's an Ithaca Journal article, but it's just a reprint of the press release. And Update again: here's their own article. Lots of questions over different kinds of "development"
One underlying theme I keep finding in the Ithaca Journal this new year is questions about how we want to build in this county. Many of the questions are about energy, but others aren't. 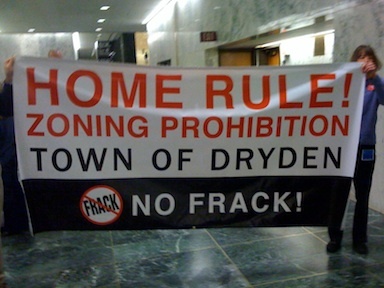 There's a roundup of news about home rule and hydrofracking, noting the Dryden and Middlefield lawsuits and Senator Seward's proposed home rule bill. My guess is that home rule will end up the compromise in the long run, through lawsuits or legislation. The company that owns AES Cayuga, formerly NYSEG's Milliken Station, has filed for bankruptcy. AES Eastern Energy had already shut down four of its six plants, leaving only this one and one on Lake Ontario active. The last few years' major electric line upgrades should ease interruptions if the plant closes. Apparently Governor Cuomo couldn't bring himself to talk about hydrofracking in his State of the State speech. I'm not sure what (if anything) that means. There's more local reaction here. In other kinds of development news, I was happy to see this column on the value of historic preservation. I was mystified by the column it rebuts, which is now behind the archive paywall. It called for more housing construction in downtown Ithaca (it's the right place) but seemed to think the way to get there was to blast anyone with different ideas as a NIMBY ("not in my back yard"). Finally, our local Habitat for Humanity is looking for more volunteers. New York State energy policy is a game that's largely about territory and players and not so much about principles. I obviously don't work in Albany, and would be happy to be wrong about much of this, but this is the story I tell based on what I've seen. The key pieces of this story aren't us, unfortunately - they're New York City and Westchester County. New York City depends on power generation from outside of the city much the same way it depends on water from outside of the city. One of the key tasks of state government for the past century or so has been keeping New York City supplied. Electricity has been a particular challenge, as NYC's supplies sometimes get stretched, especially in summer, and the temporary generators Con Ed pulls out haven't been very popular. On top of that, there's a pretty loud call to shut down the Indian Point nuclear power plant just north of NYC, which needs its licenses renewed in 2013 and 2015 to keep operating. Sure enough, it's on a fault line, and Westchester is too densely populated for the evacuation plans to make much sense. Back in the late 1980s/early 1990s there were hopes to buy electricity from HydroQuebec's ever-larger hydroelectric plants, but Governor (Mario) Cuomo stopped that, or at least barred one set of plans for doing so. The Shoreham nuclear plant could have provided power too, but a nuclear power plant in Long Island had even crazier evacuation plans than one in Westchester. More recently, the city has been looking to Upstate for power. Around 2004, NYRI, a Canadian company, proposed a major power line from around Utica to Middletown (map), serving NYC, and residents fought hard (rough summary). After a lot of wobbling, Governor Pataki denied them the use of eminent domain in 2006, and it's more or less died since. However, the Federal Government created a "National Corridor Designation" including roughly the same area. We didn't hear too much about it here because neither Tompkins nor Cortland County is included, but Cayuga, Chenango, Otsego, and Broome are. On a more specific level, the designation of a National Corridor is a necessary first step in providing the federal government - through the Federal Energy Regulatory Commission - siting authority that supplements existing state authority. The Energy Policy Act of 2005 provides a potential siting venue at FERC for transmission facility proposals within a National Corridor. In practice, this will mean that if an applicant does not receive approval from a State to site a proposed new transmission facility within a National Corridor, the applicant may then apply to FERC for a permit and authorization to construct the facility. If FERC accepts the application, before it would issue a permit, it would conduct a full National Environmental Policy Act review and consider alternatives. Article X, a law for fast-tracking power plant placement decisions, had expired in 2002. Its long failure to get renewed had a lot to do with the past crazy powerplant siting decisions, but it finally moved ahead this year. Why? Add powerlines and/or gas pipelines from Upstate to the NYC area. Point (3) appeals to most Downstate environmentalists. Until recently, natural gas seemed like the miracle fuel, burning cleaner with less climate change impact (yes I know that's questionable), and wind farms were the future, so point (2) also appealed to Downstate environmentalists. Point (2) tied in nicely to growing desperation Upstate for economic development of any kind as well. Point (1) has always been ugly, but maybe the Feds would take care of that for the state, and let Albany off the hook? This plan, of course, isn't going over very well in a lot of Upstate communities, largely because of hydrofracking. Powerlines don't make people happy, but pollution can force them to desert a place. How does this tie to home rule and Senator Jim Seward? Seward's home rule position lets him find political balance on most of this, except with the relatively small group of voters who have the time to see how the pieces don't fit. It's a classic Albany compromise, in which elected officials can make themselves look better than the oil and gas industry who are busy suing us, while still permitting the companies to do a lot of what they wanted anyway. Update: Also posted at The Albany Project. Some days I just don't get it. 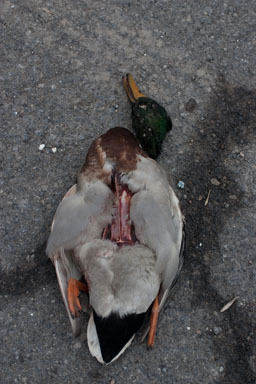 I heard from a friend on Facebook that she'd seen dead ducks and geese on Lower Creek, and wasn't able to get anyone in government to take a look. 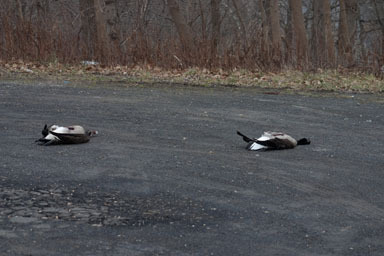 I went over - to the turnaround just north of Route 13 on Lower Creek Road - and sure enough, there were two dead Canada geese and one dead mallard duck. 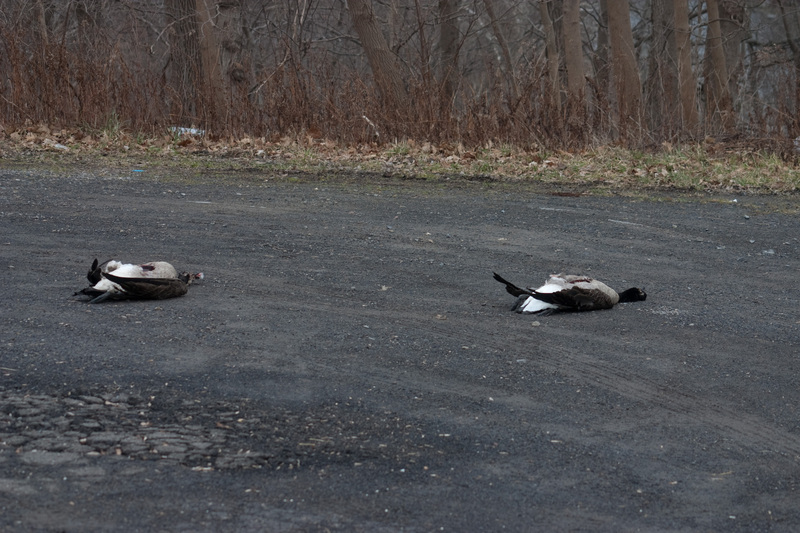 Dead geese, Lower Creek at Route 13. Dead mallard, Lower Creek at Route 13. I didn't see signs of shooting, though I didn't look that closely and didn't handle them. It seems really unlikely that a car would have hit all of them. They all seemed to have their breastbones exposed and were missing what would be the breast meat, though I don't know if that happened later - a passing animal? Very very strange, and weirdly disturbing. Sorry if this one is too graphic. Paywall coming soon to the Ithaca Journal? In conjunction with this effort, we are also investing in the unique local content we deliver across all platforms including tablet, mobile, and new technologies as they come to market. I hope that means they'll hire more reporters, and let them stick around after they've learned the local landscape. Dryden Daily KAZ points out a great letter from many Upstate Republican State Senators, outlining their plans to "continue fighting during the upcoming State budget negotiations to ensure a fair and equal distribution of aid to all regions of the State and help local schools control costs by eliminating unfunded mandates." Tompkins County officials wanted to raise their mortgage recording tax from three-quarters of a percent to 1 percent. But Robertson said their state Senate delegation told them such a bill wouldn't make it through their chamber. Meier, who was a state senator, didn't actually raise the tax. Instead, he supported the legislative bill allowing county legislators to increase the tax. But the criticism still hurt, and Democrat Michael Arcuri won the congressional seat. The 2006 race surprised me in many ways, but I never would have forecasted it changing what "business as usual" means in New York State. Back in October, I had some questions about the DEC's take on Naturally Occurring Radioactive Materials. Today, reading the Environmental Protection Agency's comments on the dSGEIS, I got a bit of a jolt. "the results, which indicate levels of radioactivity that are essentially equal to background values, do not indicate an exposure concern for workers or the general public associated with Marcellus cuttings." This leaves me wondering whether radiation conditions at the surface are higher than they are in most rock formations except the Marcellus. Most of the comments are "one agency to another" kinds of things, suggesting, for instance, a lot more public mapping, but these really stood out to me. They also make me wonder if there's more to the radon concerns I raised in my own dSGEIS comments. If there's more radioactive material, there's likely more radon available to be carried with methane through cracks in the rock. It's only a couple of inches (so far), but it's great to finally see my back yard looking like it should in mid-January. 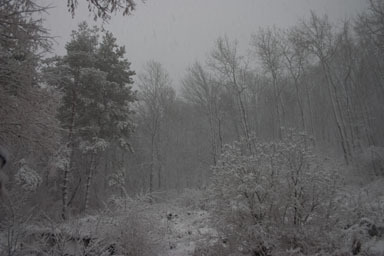 Snow up in the trees and still coming. Cortland and Groton schools closed, but it looks like Ithaca and Dryden are open. Update: Dryden High School/Middle School is closing early, at 2:00pm. I stumbled on a copy of Nuclear Power and Its Critics: The Cayuga Lake Controversy last week, and grabbed it. I still remember Joyce Gerbasi explaining to a very surprised and younger me that NYSEG had wanted to put a nuclear plant, Bell Station, next to the coal-fired Milliken Station/AES Cayuga (that's now in bankruptcy). "By March 1968 increasing numbers of us were articulating our unanswered questions about the power plant's effects on the lake in the form of letters to local editors and legislators, the utility was preparing to break ground for Bell Station (as planned), and it appeared unmistakably clear that a unilateral industrial decision about use of a needed resource was beginning to be implemented." I was pleased to see that the Cayuga Lake Watershed Network gave the Citizens Committee to Save Cayuga Lake an award last year remembering the work they'd done 40 years ago. Home rule is a conservative position that democratically elected local governments, closest to the people, decide what's appropriate for their communities -- as they do with other commercial and residential uses. For some to claim that my home rule legislation will make it more difficult for gas drillers to deal with a crazy quilt of local rules and regulations, I say this: first, drilling companies are used to it; and second, reluctance to do business in New York may have more to do with the price of natural gas or our geology. At the end of the state's now three-year-plus process, New York will have greater uniformity than other 'home rule' states. My legislation offers nothing out of the ordinary where gas drilling is concerned. One argument against my legislation is that local governments are not equipped to review applications or respond to the submissions of multi-national gas drilling companies. To be clear, home rule does not authorize local governments to regulate how natural gas drilling is conducted, but where it is permitted, much like town zoning rules establishing where someone can operate a slaughterhouse, a gas station or any other commercial use. The state would continue to review drilling applications and be responsible for the issuance of permits. Thank you Senator Seward, for expressing this so clearly, and for continuing to push these ideas in a State Senate whose leadership is not always so supportive. Dryden Community Center Cafe, 1 West Main st.
January's class will be all about Dryden Community Garden's group seed order from Fedco Seeds. Last year was our first group order and it went very well for everyone - we got a 20% discount! There are many reasons to choose Fedco Seeds, including, "Welcome to Fedco Seeds, your source for cold-hardy selections especially adapted to our demanding Northeast climate. Each year we observe hundreds of varieties, selecting only the best for inclusion in our catalogs. Through our product lines and cultural hints, we encourage sustainable growing methods. We offer a large selection of certified organic cultivars and regional heirloom varieties. We buy products from all over the world." Join us this month to learn how to place your order either online or using Fedco's lovely paper catalog and placing a handwritten order with us. We will also talk about the idea many people have had for having a seed and plant exchange club. February's class is Planning a Garden, very good for the new gardeners who are unsure of what and how much to grow, when to plant, how much space they will need, what challenges to expect and how to handle them. This will partly be a Q&A type group so we really hope that experienced gardeners join us to share their knowledge. For March we'll be having the Big Spring Community Garden Sign-up where Jean and Kerra and other garden members can answer questions about the community garden, we can share ideas, voice problems encountered last year, etc. We'd also like to get some ideas for future classes. Also, we have a class topic we'd like to cover but are still looking for a speaker. There have been some questions lately about what different labels mean on foods, seeds and household items. What are the different Fair Trade certifications, Organic, Natural, All Natural, Certified Organic by____, etc. ? We would call the topic Understanding Eco Labels. Yeah, that sounds good. Now I just need to find someone to answer our questions. To teach and learn and meet new people, to build connections in the community, to have organic air-popped popcorn with nutritional yeast and sea salt (or plain, or bring your own topping), to have locally grown and/or wild harvested herbal teas, to get out on a Tuesday night, to be part of the great, beautiful, wonderful thing that is our community and our food. All ages are welcome, there are toys and books for little ones. Donations are gratefully accepted to help us cover the cost of materials, snacks, and advertising. While redistricting seems unlikely to make a drastic difference in Dryden, two Dryden County Legislators are making competing cases about how the Legislature should run and came to a deadlock at the beginning of the year. The legislature meets tonight to try to sort things out, and it sounds like there may also be multiple candidates for the Vice Chair position. The SPCA will have a free rabies clinic Wednesday night from 7:00pm to 9:00pm. Tompkins County may be about done with its independent redistricting process, but New York State lumbers on slowly toward new districts for the State Senate, Assembly, and Congressional seats. Basically, no one has a good idea what the final lines will look like for the New York State Assembly and Senate, or for Congress. If the process continues as usual, through LATFOR, the Democratic Assembly will draw the Assembly lines, the Republican Senate will draw the Senate lines, and everyone will scramble over the Congressional lines. It's pretty much a classic New York parody filled with self-dealing and lobbyists, and County Legislator Mike Lane was right to call it corrupt a few months ago. Governor Cuomo has said he'll veto redistricting that isn't independently done, but he's said it more quietly lately, a veto override is at least conceivable, and the courts may or may not want to get involved. There could be some kind of jointly appointed commission, though the head of the Assembly's work on redistricting is uninterested in such suggestions It's not clear. Maybe it'll be part of a budget deal? The timing is similar. That's in some extra chaos right now because Republicans have claimed they should create a 63rd seat. The math and constitutional questions on that are pretty mind-boggling, and will likely go through the courts. If you'd like more, including tools for drawing up your own maps, Common Cause's Citizens Redistricting Commission is pretty much the place to look for information on redistricting. They've posted "Reform Maps" in particular. Those could become important if these issues get resolved by a judge in an hurry to have lines in time for the elections. To see what's at stake, you might compare their Senate map (using 62 seats, since no one seemed to guess 63 before the Republicans claimed it) with an unofficial pass at what a 63-seat NY Senate might look like if drawn to give Republicans maximum advantage. Even that definitely gerrymandered map manages to be a little less weird than the current lines, losing our current "Abraham Lincoln riding a vacuum cleaner" Senate seat. The best way I know to describe the situation is "completely cloudy", and I have no idea how or if they'll resolve it before it's time to start the election process. We'll see! Update: The Congressional redistricting conversation just changed a bit with Congressman Hinchey announcing his retirement. 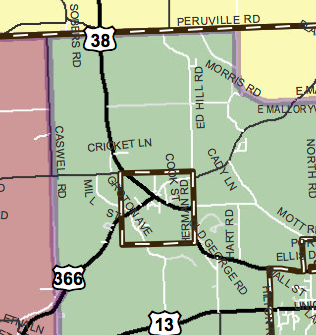 Dryden used to be in his district, then shifted to Boehlert / Arcuri / Hanna in 2002. Hinchey's current district is a strange reach from the Hudson to Ithaca. Here's more about the possibilities, and why they may scare area Republicans. Update 2: And here's a New York Times piece that opens with the challenges of running for State Senate when you don't know what district you'll be in. Yes, this may seem far from Dryden, but if SOPA (H.R. 3261), PIPA (S. 968), or something similar passes, you may not be able to read the existing Living in Dryden site much longer, and I'd have to write anything new in a very different way or risk getting shut down for copyright violations. Unfortunately, Dryden's Congressman, Richard Hanna, seems to believe that commercial speech should be welcome to trample over plain old free speech. It's not just Republicans, either - both of our Democratic Senators, Chuck Schumer and Kirsten Gillibrand, support the Senate version, PIPA. Schumer's office seems to enjoy being rude about it, too. SOPA is sort of kind of on the shelf, slightly defanged, but PIPA still has debate scheduled for later this month. This bill, and its House counterpart, cannot be fixed -- they must be killed. Wonder what it's all about? Try this, or this, or watch this. I do think piracy is a real issue, as another Dryden publisher eloquently explains. I just don't think it's a good idea to make the Internet deeply fragile in order to protect a small crowd of businesses who already have plenty of power and money, but not much business model, as my co-worker put it. Normal service will resume Thursday. Until then, I've censored (most of) the pieces that might lead to this site vanishing under SOPA or PIPA. Update: I'm glad to see One of Nine with a banner about SOPA and PIPA across its top, and Dryden Daily KAZ with a piece opposed to it as well. Like KAZ, I make my living with intellectual property, but this law goes way too stupidly far. Thx for your views on #PIPA. I agree there are real concerns with the current legislation & I'm working to make impt changes to the bill. We must work to strike a balance btw ending online piracy to protect #NY #jobs & ensuring Internet freedom so our tech commty can flourish. But what that actually means in terms of action, I have no idea. 140 characters does make it tricky to say, though. Update 3: Hanna's now trying to sound mushy, as are Schumer and Gillibrand. We'll see. If you plan to attend, please call Sue @ 272 8919. Questions? Call Carole Fisher at CCE-Tompkins, (607) 272-2292. The Legislature overcame repeated deadlock at its last meeting two weeks ago, and reelected Martha Robertson (D - District 13, Dryden) to her third year as Legislature Chair in 2012. The Chair's position is filled each year by a majority vote of the 15 members of the Legislature and is responsible for overseeing all Legislative functions. While the Legislature at its last meeting voted nine times but failed to reach a decision because of repeated, 7-7 tie votes, tonight's decision came by a single ballot, with 9 Legislators voting for Robertson and 5 for Mike Lane (D - District 14-Dryden). Voting for Robertson were Legislators Pat Pryor, Jim Dennis, Will Burbank, Peter Stein, Dooley Kiefer, Nathan Shinagawa, Robertson, Carol Chock (who had been excused from the last meeting), and Brian Robison, who changed his vote from the previous rounds two weeks ago. Voting for Lane were Legislators Pam Mackesey, Frank Proto, Leslyn McBean-Clairborne, Dave McKenna, and Lane. Legislator Kathy Luz Herrera, who had voted for Lane the last time, was excused from tonight's meeting. Congratulating Robertson on her election, Lane said he believes this year's leadership process was valuable, that the more the process is open to public view, the better it is for everyone. Chair Robertson told her colleagues she looks forward to working extremely hard with them in the year ahead. For Vice Chair, five candidates were nominated: Legislators Jim Dennis, Will Burbank, Peter Stein, Frank Proto, and Kathy Luz Herrera. In one ballot, results were split--with 5 votes for Proto, 4 for Burbank, 2 each for Dennis and Stein, and 1 for Luz Herrera. In comments before the ballot, several legislators commented on the importance of the person in the Vice Chair position to serve as a complement to the Chair. After the single Vice Chair ballot, Legislators voted 12-2 to postpone the decision until the Legislature's next meeting February 7. Last year's Vice Chair, Dooley Kiefer, will continue to serve until a new Vice Chair is elected. Somehow the press release, while containing fewer quotes, seems to tell more than the Ithaca Journal story. Happy New Year to all Cafeteers! The 2012 Annual Meeting of the Dryden Community Center Cafe', Inc. will take place at the Cafe on Monday, January 23rd, 2012, starting at 7:00 pm. Please come and catch up with Cafe news and planning, and if you are a member (or if you cleverly start or renew your membership upon your arrival at the Annual Meeting) then you are eligible to vote for the four open positions in our nine-member Board of Directors. Who is running for the Board? Perhaps you will be! Our nominating committee is seeking additional people who are interested in a two-year stint on the Cafe Board of Directors. If you are interested in joining the Board, or would like to suggest somebody else, please contact Evan Kurtz, chair of the nominating committee, at 423-2693 or by email at evantracykurtz@gmail.com. Membership remains only $10.00 for individuals or $20.00 for couples/families. There are few perks, honestly, other than voting for directors, occasional members' events, and that warm feeling that you get inside. But you will be a part of a successful not-for-profit community cafe adventure that against all odds is celebrating its fourth birthday this year. * Of course, nobody is more a part of the Cafe than our amazing corps of volunteers. Please remember the Cafe if you have a bit of spare time and want to spend it among friends and friends to be, whether baking, behind the counter, fixing things or sprucing them up, or contributing your own particular talents in whatever way you and we can envision. Regular or occasional volunteers are both warmly welcomed. Please talk with our manager Suzanne at the counter, or any Board member, or just reply to Suzanne's Cafe email 1westmain@gmail.com, and we will point you in the right direction. Thanks for all that you do, and see you at the Cafe! *Actually, this year is really our first birthday, if you count from our first day of business on 29 February 2008. I'll be giving a talk at the Varna Volunteer Fire Company next Thursday, January 26th, at 7:30pm, on local weather, weather forecasting, and their relationship to emergency services. I'm planning to start with a look at some of Dryden's past weather disasters, and then explore what current weather forecasting can do (and can't do). We like to think that we live in a place where the weather is always interesting but rarely extreme. While it's true that we don't have hurricanes coming on shore here or large bursts of tornadoes, we still do have hurricanes, tornados, blizzards, freezing rain, hail, microbursts, floods, high winds, heat waves, and more. This area combines huge microclimate variations with a mix of weather coming from the interior of North America, the Arctic, and the Atlantic. A key part of the talk will be exploring ways to get (and interpret) weather information and ways to give back weather information. The vast amount of weather information available today is fantastic, but it also has limitations. Those limitations are both warnings to us to use it cautiously and an opportunity for us to help contribute. The talk is a training talk, but free and open to the public. It'll be about a 45-minute talk with additional time for questions and discussion. The weather's been tricky since I first started making ice lanterns, but tonight's cold and low winds are about perfect. I've also gotten a little better at making them. 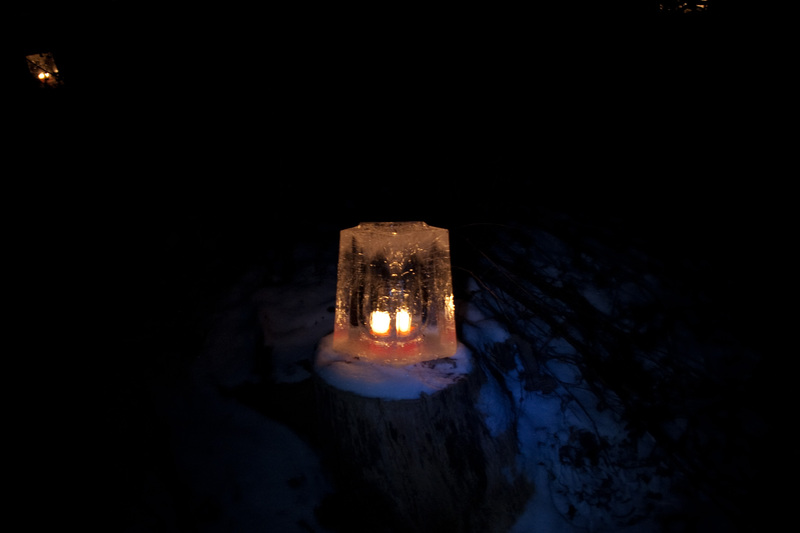 The main problem I've had is that candles melt everything around them, or just melt to the bottom, get put out by water, and then freeze into the lantern again. That makes it really hard to reuse the lanterns, as the old candle is usually inconvenient. New lantern shining on a stump by the driveway. Even the old, imperfect, and sometimes downright weird ones can be beautiful, though. 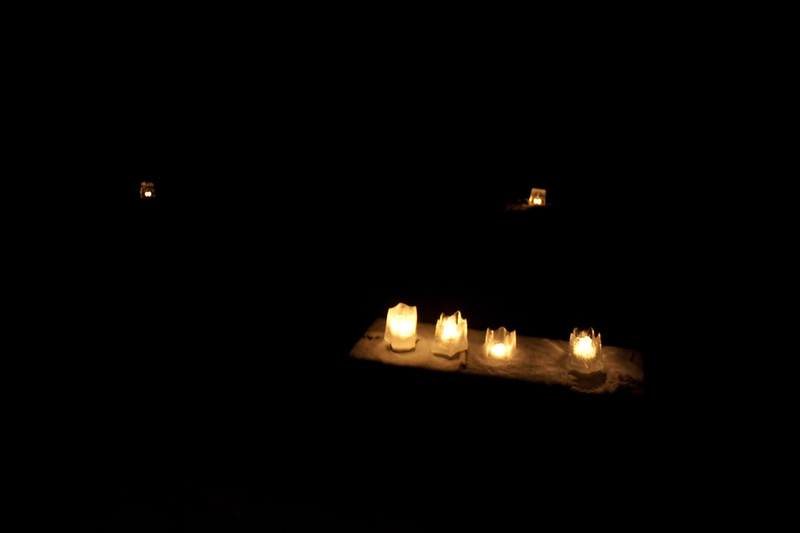 Old lanterns, molded by warmth and rain. 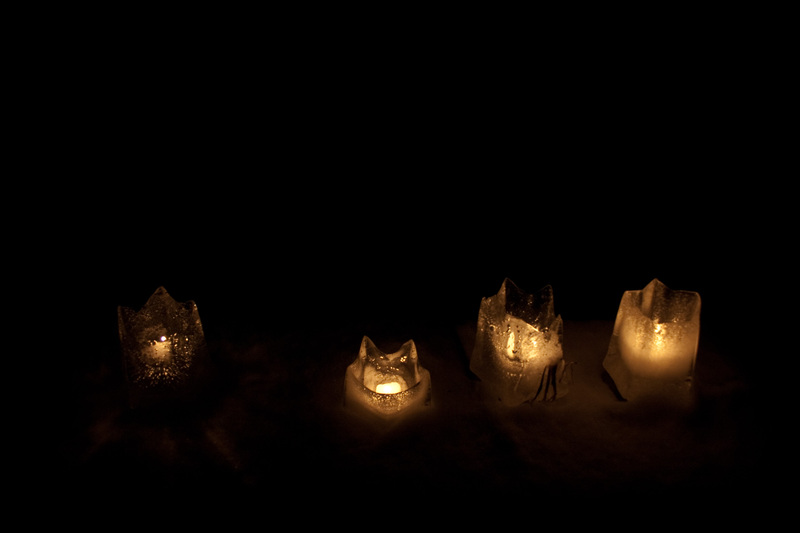 Four old and two new lanterns. Next year, I think I'll explore some of these suggestions for making bigger and better ones. I haven't spent that much time looking at the intricacies of school budgets over the past few years. Dryden Daily KAZ has, and tells a painful story of rising expenses New York State only shifts around instead of addressing. an employee at an independent software development consulting firm who allowed unauthorized access to one of the companies' customer information systems. The customer records contain Social Security numbers, dates of birth and, in some cases, financial institution account numbers. Of course, the data may have been just as unprotected before NYSEG was bought out - at least I don't think we heard of any breaches. A year of credit monitoring service from a company that I'm sure will hope to sell us continuing credit monitoring services doesn't really make things better. Want to know more? Here's the letter you'll likely be getting, the press release, and the frequently asked questions (FAQ). It sounds to me like it was their main billing data, though I'd love to be wrong and find out that it was a smaller subset. Let's hope they do a better job with natural gas than they do with personal information. The Ithaca Journal has more on the lobbying day. 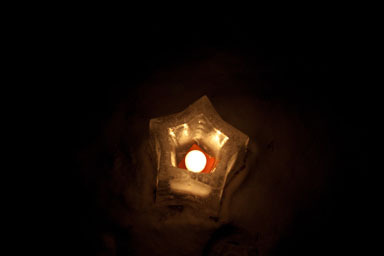 With the higher temperatures, my count of ice lanterns plunged. I couldn't make new ones, and last night there were only five worth trying. I cleaned up the remains this morning - not much left! Sunday night looks like the next possible time to make any lanterns, and even that's kind of iffy. Not that it makes the local battle any less important, but I've had a hard time for a while believing that the rush to drill here made much economic sense. It's not that I question there being gas here, but the prospects seemed badly oversold. Large amounts of natural gas are produced in conjunction with the production of hydraulically fractured shale oil and in association with conventional oil drilling. Given the price differential between oil and gas at present many companies have changed their focus to shale oil or liquids rich shale gas to enhance economic returns. Although much associated gas in the production of shale oil is simply flared, as in the Bakken play in North Dakota, much is also produced into the market even at current low prices. As that article makes very clear, the decline rates on shale gas and shale oil wells are very fast, so this situation won't last forever. I'm guessing, though, that even if New York State gave drillers everything they claim they want in the dSGEIS, we wouldn't see an army of drilling rigs crossing the border the first day it was legal. I suspect we'd see some test wells to see how things look, and then a wait for gas prices to climb to a level where drilling these intensive and expensive wells is profitable. Given that, I suspect the gas companies are quite pleased with the delays in New York. It lets them argue that the leases they bought cheaply should be extended while they wait for prices to go up, and gives them a story to tell impatient investors who thought they'd have the money by now. Their lawsuits and lobbying are still important - after all, they want to be able to get to New York's gas in the long run, and they have a core group of dedicated supporters pushing hard now. It's much harder to put that kind of enthusiasm on hold and bring it back later than to sustain resistance. Overall, though, I can't help thinking that the gas companies' outrage at New York State's delays is theater meant for Wall Street and a few politicians. Some days I wonder if Dryden is stuck as a bit player in a pump-and-dump stock swindle, forced to defend itself against projects whose value is far less certain than the costs. As always, Dryden Town Talk is a must-read. Volunteer opportunities, jazz concerts, pancakes, chowder, a father-daughter dance... there's lots going on! I guess State Senator Jim Seward's earlier comments about home rule didn't sit well with the Dryden Safe Energy Coalition folks. Tracy Marisa (of One of Nine and webmaster of the DSEC) writes to argue that local government should stay out of the drilling conversation. I never thought I'd see the day when Republicans would argue that New York State regulation was the conservative solution and that the DEC was our reliable guardian. Somehow, though, that's been the story for the past six months or so. I guess that makes Texas, where home rule is just a given in the drilling conversation, a bunch of crazy hippies, and not just in Austin. Update: And the pro-fracking forces are even praising the President. Maybe "forget the local, forget the State. This should be federal!" will be coming soon to Dryden? I can't begin to say anything nice about this. Proposed NYS Senate and Assembly maps. "Our" legislators have no shame whatsoever. I'll dream about Governor Cuomo vetoing this nonsense, but I won't hold my breath. Update: Proposed State Legislature maps are available. Today the weather is just unseasonably warm but seasonably dismal - but sometimes we get more dangerous weather here too. I gave a talk last night to the Varna Volunteer Fire Company about weather disasters, exploring some of the extremes we've had here, how forecasting is getting better at predicting (some of) these things, and what people can do to help. I've posted a PDF of When the Weather Becomes Deadly (1.5MB) if you're curious. The first half is mostly history, and the second half is more forecasting and helping forecasters. Thanks to the Dryden Town Historical Society, Elsie Gutchess, Gina Prentiss, Mike Lane, Carol Kammen, Duane Testut, and Dawn Potter for helping with the history. Thanks to Highway Superintendent Jack Bush for using his photos, and to David Makar for his ice storm photo. Thanks to the VVFC for having me, and thanks to the National Weather Service for holding Basic Spotter SKYWARN training here last year. What do snow, tornadoes and groundhogs have in common? Come to the Freeville Potluck Dinner THIS SATURDAY starting at 5:30pm! Meteorologist Drew Montreuil will be talking after dinner [7pm?] about lake effect snow, tornadoes in New York, and who is a better forecaster: himself or Punxsutawney Phil! U.S. District Court Judge Gary Sharpe has ordered that New York State have a June 26th primary. Since we still don't even have congressional district maps, this will be complicated. It's time for Village of Dryden elections again, or at least time to prepare for them. The 2-year terms of Trustees Charles Becker and Don Norman are expiring. The election is in March, but the caucuses to select candidates will be held Tuesday, January 31st. Democrats will be meeting at 8:00pm Tuesday at Village Hall, 16 South Street.